Funding resources for UK technology ventures and spin-outs have diminished in recent years, providing an opportunity for private investment. This is further compounded by pressures to reduce overheads in non-core activities so that there is also less expertise available to nurture and support them. 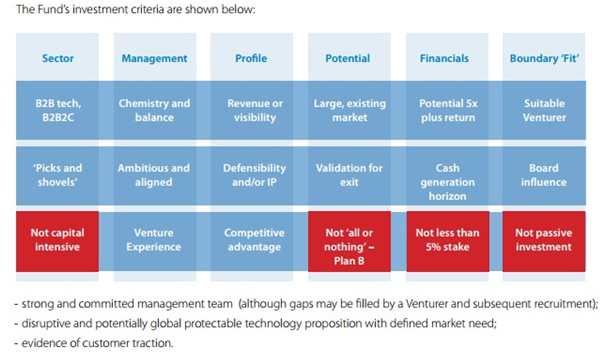 Technology ventures tend to have all of the challenges of normal start-ups, as well as additional ones. Many start with some intellectual property for a particular technology, but often do not succeed because the management lacks the business skills and experience essential to grow the business. This has left a funding and skills gap which the Fund seeks to address. Boundary Capital was set up in 2009 initially from a network of business angels to become a venture capital company focusing on early stage technology investments and with a pro-active approach. As well as funding, we can also provide commercial assistance, including business development. We have a network of over 300 investing directors with specific expertise who can help open doors with customers and partners, as well as advise and help shape and develop your business. Boundary Capital Partners has built aunique network of entrepreneurs and executives (known as “Venturers”) for their specific domain expertise and their track record in working with small businesses. These Venturers are also able and willing to invest their own personal funds alongside the Fund to align their interests as well as reducing the requirement for risk capital by taking shares in return for their services (also known as “sweat” equity) rather than paying full market rate. In addition, Boundary Capital also provides support and processes to assist with IP development and protection, strategy, business development and finance, depending on the requirements of the company. Boundary Capital denotes companies with returns of 5 x or more as “Home Runs”. The opportunity is to participate in a tax-efficient fund in early-stage technologies with the potential for excessive returns if one or more Home Run investments are realised. However such returns cannot be guaranteed and the nature of early stage investment is that it is high risk and many companies may fail due to their uncertain nature. The Fund aims to mitigate these risks by the use of the investing executives, the “Venturers”, careful portfolio management and ensuring we have sufficient investment reserves to follow through subsequent investment rounds as the companies grow and mature. The Fund will not invest in concepts. Whilst the Fund will primarily invest in technology businesses, it will also consider businesses in other sectors which show potential for growth and fulfil the other investment criteria. Toxibact has a novel potential antimicrobial therapy for the treatment of all bacteria – both ‘gram positive’ and ‘gram negative’ – and fungi. The drug was conceived and developed after independent, private research. Its unique mode of operation means it is not possible for the microorganisms to develop resistance. AB-Polyblock has a novel potential drug therapy for the treatment of Alzheimer’s Disease. The drug was conceived and developed after independent, private research. Alzheimer’s Disease is the largest cause of dementia and is a growing problem due to ageing society. The total estimated worldwide cost of dementia is US$818 billion in 2015, which represents 1.09% of global GDP. There are an estimated 46.8 million people worldwide living with dementia in 2015. This number will almost double every 20 years, reaching 74.7 million in 2030 and 131.5 million in 2050. These investments have once again reaffirmed Boundary Capital as a keen of champion early stage technology and life science companies. Watch this space for Boundary Capital’s pipeline of future opportunities. If you are interested in further information about this fund and future opportunities please contact us on info@kuberventures.com or +44 (0) 20 7952 6685.